Death of teenager sparked rare public outrage over war on drugs. More than a thousand people attended a funeral procession on Saturday for a Philippine teenager slain by police last week, turning the march into one of the biggest protests yet against President Rodrigo Duterte's deadly war on drugs. 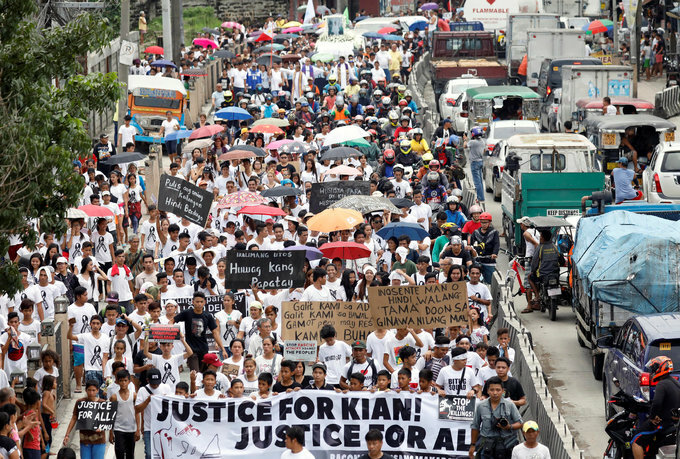 Nuns, priests and hundreds of children, chanting "justice for Kian, justice for all" joined the funeral cortege as it made its way from a church to the cemetery where the 17-year-old was buried. Delos Santos' father, Saldy, spoke briefly during a mass to defend his son's innocence and express anger over the police. "Don't they have a heart? I'm not sure they do. There's a lot of churches, they should go there," he said, his voice cracking with emotion. If accepted, the complaint would follow at least two cases filed last year against police over Duterte's war on drugs, which has killed thousands of Filipinos, outraged human rights groups and alarmed Western governments. Delos Santos' flower-draped coffin passed through a major highway on a small truck decorated with tarpaulins reading "Run, Kian, Run" and "Stop the killings" displayed on each side. Passing motorists honked in support. "This is a sign that the people have had enough and are indignant over the impunity that prevails today," Renato Reyes, secretary general of left-wing activist group Bayan (Nation), said in a statement. "The people protest the utter lack of accountability in the police force." "I came to support the family. I want justice for Kian and all victims - including my son," said Katherine David, 35, whose 21-year-old son was shot dead by police with two other men in January. Most people in the Philippines support the anti-drug campaign, and Duterte remains a popular leader but questions have begun to be asked since the death of delos Santos, which came during a spike in killings across the Philippines' main island, Luzon, last week. The president's communication office reiterated on Saturday he will not tolerate wrongdoing by law enforcers and called on the public to "trust the justice system under the Duterte presidency." 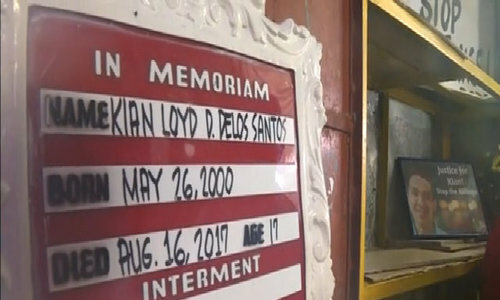 But bereaved mother David believes the response to Kian's killing marks a turning point in opposition to the drug war. "There's been a big change. Before, police could kill and nobody paid attention. Now people are starting to show support and sympathy," she said.